Interestingly, the idea of pod taxis isn’t as new as one would imagine. Indian cities have seen similar experiments before: The Chembur – Wadala – Maharaja Chowk monorail project, the airport feeder metro built by the Delhi Metro as a PPP project which was subsequently converted into the orange line. Both have had their share of criticism. However, the closest to the concept of pod taxis was perhaps the Goa Sky Bus (check box for details), where one person actually lost his life! So will this system work for a city like Bengaluru? How would one categorise the proposed pod taxi system? Would it be a mass transport system? Let’s begin with what a pod taxi is. It is basically, at the core of it, much like a ropeway system. It is categorised as an automated guidance system which are of two types – Group Rapid Transit and Personal Rapid Transit (PRT). Pod Taxis are the PRT variety (which is being proposed in Bangalore). It has limited and low carrying capacity and therefore cannot be a main mode of transport. It does not provide last mile connectivity. However it requires the rigid infrastructure of main mode or system that works on ROW A and has an equivalent cost. The main idea of urban mobility is to have main modes complemented by access modes. And pod taxis don’t fit into either of them. So I am not sure where it is that the pod taxis fit into the overall scenario of urban transport in Bengaluru. But are there are no advantages to the pod taxi system at all? Pod taxis bring all of the advantages of ROW A systems. Speed and safety. But these aren’t the only factors that we need to look at. We have to consider fast mode versus accessibility versus the cost of it. Here is an important disadvantage. The capacity. Pod Taxis can hit a maximum capacity of 9,000 or 10,000 people per hour per direction at the numbers they have provided, which is about 6 per cabin. Cabin Capacity and frequency decide the overall system capacity per hour per direction. With the metro, this number is 69,000. The BMRCL (Metro) of course is running at much lesser capacity, because we haven’t picked up on the frequency of the trains. The pod taxis would also depend on the frequency. The metro is a better option for corridors where you have to travel longer distances, and travel demand is very high. Neither the pod taxi nor the BRTS can serve this demand. Pod taxi systems or cyber cabs are present in a few cities where they connect multiple academic campuses. Can you elucidate where the concept of pod taxis work and if they are functional anywhere else in the world as part of an urban public transport system? You are right. Pod Taxis work as a PRT system in MorganTown in West Virginia which connects three campuses of West Virginia University and also in Masdar, AbuDhabi. There again it connects the Masdar Institute of Science and Technology. So Pod Taxis have largely been part of controlled spaces, not part of an urban transport system. Like I said before, a pod taxi is like a ropeway. It has come up in the last twenty odd years. And it is not a system that has picked up anywhere in the world. The Group Rapid Transport version is popular at airports like Frankfurt and London etc. It is used as public transport system in one city in Germany. 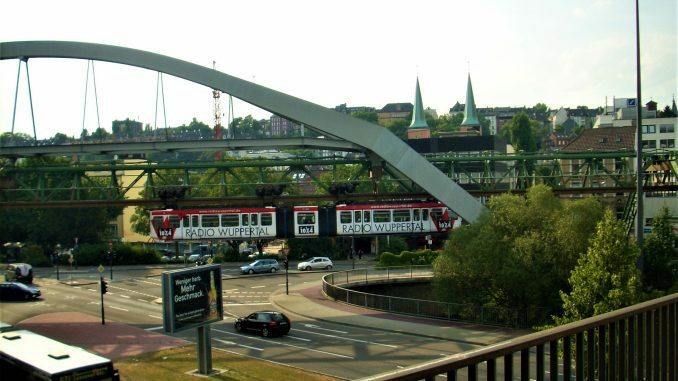 Schwebebahn (the name of the GRT) works in Wuppertal, a tiny city in West Germany with a population of less than 30000, that is a linear city built alongside River Wupper in a valley. 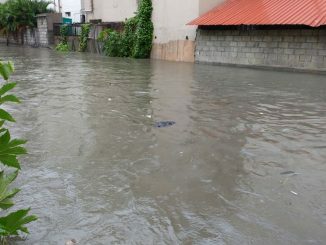 That river is so narrow, you could be forgiven if you mistake it to be a Rajakaluve in Bangalore. The system is now primarily a tourist attraction. The project that comes closest to the proposed pod taxi system in Bengaluru was the Goa Sky Bus, similar to the Schwebebahn Wuppertal mentioned by Professor Verma. The difference between the two is that Schwebebahn has a single track, where as the Goa Sky Bus had a double track. However this was planned as a Group Rapid Transport (GRT) system and not a Personal Rapid Transport (PRT) System as proposed in Bangalore. In 2004, the Konkan Railway, which was headed by E Sreedharan at the time, opened a 1.6km test track of suspended railway system that would run above regular traffic in Margoa, Goa. The indigenously built prototype was planned as a 10.7 km project to connect Panaji with Mapusa. However in September of 2004, during a trial run, one of the coaches hit the concrete track pillars where one person was killed and three were injured in the accident. Nine years later, the Konkan Railway scrapped the project and dismantled the track in 2013 to prevent recurrent expenditure on monitoring it. The official reason stated in the press at the time to abandon the the project was that Konkan Railway could not develop a Swing Arrestor and Switching Apparatus that would address safety concerns. You have been an advocate for the BRTS system to help ease traffic woes of Bangalore as an at-grade solution. However at-grade solutions seem unviable given the ever increasing traffic. Can pod taxis be the counter option because they are not at grade? Let’s look at the problem of at-grade traffic with the modal share. Right now, Public Transport is at about 40%. 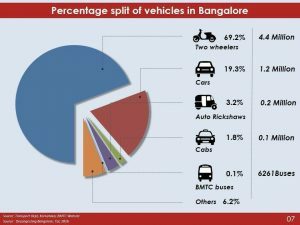 With current population of Bengaluru, this mode share is at least 20% less than what it ought to be — about 60 to 70%. Non Motorised Transport or NMT is less than ten percent. That includes both walking and cycling. As far as private transport is concerned, a chunk of it is from two wheelers. Cars take on 5% of the trips. The problem is the amount of space they occupy. We need to understand this problem through the notion of space. I will break it down mathematically for you. The dimension of a car is about 3 metre by 2.5 metre (if it is a sedan). The dimension of a bus is about 10 metres by 2.5 metres. Now a car on an average will carry a single person. Let’s be generous and increase this number to 1.5. A bus on the other hand can comfortably carry about 50 people. Divide the space taken by the number of passengers. In a bus, it requires just 0.5 metre square to transport one person. In car that number is 5 metre square. The difference is ten times! This is school level math that our friends in the government don’t seem to understand. So you do not agree that at-grade solutions are saturated and therefore pod taxis are the way forward, right?. This idea of pod taxis presents a classic case of consumer theory in economics. We base our study of transport mode choice on this theory which dictates preferences for anything, driven by spending capabilities. Modal share captures the probability of choosing a specific mode based on certain attributes of each model which are important to you as a user. These attributes could be access time, speed, travel time, cost or transfer time. We can also quantify comfort and convenience. And bring them together for every mode of transport with corresponding values. This is what we call an utility equation. This basically denotes, what is the attractiveness of the mode or disincentive for choosing a particular mode. If you are expressing this as a direct combination of travel time and travel cost, the higher these two units are, the lesser attractive the mode is. You can calculate this for each mode. Previously, our transport system was supply driven (your travel plans depended on what were the options available to you to get from point A to point B). Today is it demand-driven (where newer options are added and planned based on an increasing demand for travel). So when the planning is demand driven, any new infrastructure project should be planned in such a way that it yields maximum utility for the given investment and for the longest possible time. But again, the problem remains that any at-grade solution is still going to face problems with speed, thus impacting the time required to travel. If it is a trade off between cost and time, most people would prefer to save time. People also demand short term solutions. How do you counter this argument? Saving time is of paramount importance. There is no question about it. But currently the BMTC works on the ROW C system where it moves through mixed traffic. 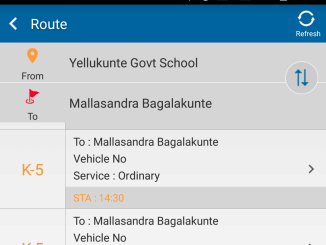 So obviously the BMTC officer’s joke that pedestrians will overtake buses after a point actually rings true. The BRTS system on the other hand moves BMTC to ROW B system that will increase their efficiency. 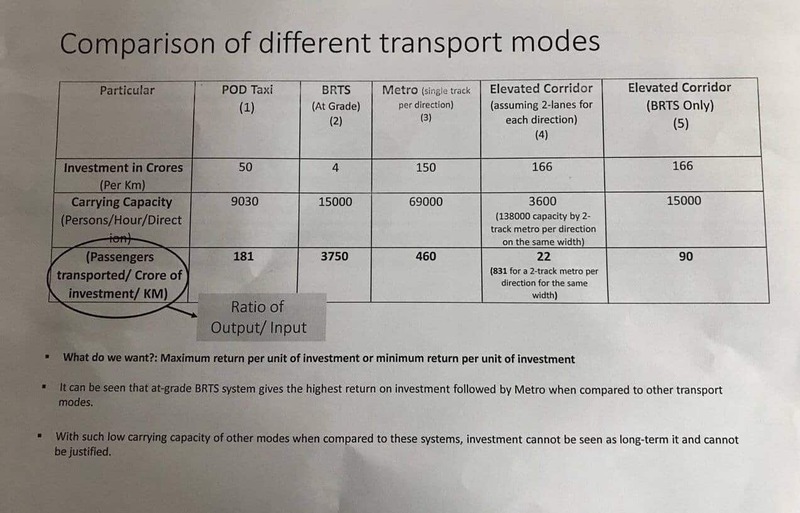 We also have a very wrong understanding of the BRTS system with rigid routes. What it should be, is a flexible model of movement for public transport. Unfortunately, the Bogota model is what functions in India. The capital city of Columbia has the largest BRTS system in the world with 40,000 people per hour per direction. That is the largest in the world and most extensive. But they haven’t been able to replicate the model anywhere else in the country. The city still has opted for a metro system to move people. Let’s look at speed in the context of pod taxis. The speed that they have quoted — 60 km per hour — is the running time and does not factor in acceleration and deceleration. But when you talk about speed you have look at it as door-to-door speed. Because that is what matters. What is the door-to-door travel time? It is not as if the pod taxi drops you in front of your house. The real picture is lies in what is the time taken for end-to-end travel. The same logic holds good for the elevated corridors as well. You maybe running faster in certain sections but what is the time you take to travel from door to door. In the context of pod taxis, we have to consider the cost of the rigid infrastructure which is not meant for sub arterial roads without a plan for integration – how will that work in favour of time? We are unable to integrate our metro and railway station. For example, look at the time for transfer between the metro and stations like Cantonment and Yeshwanthpur. On the other hand, buses have better flexibility and have a wide range of cabinets and come in different sizes. You can run smaller buses. Even accessibility to a bus stop will be better than the access to a pod taxi. Now about short term solutions. Quick improvement or short term solutions are meant for six months or one year. They are low cost and should not be planned at Rs 50 crore per kilometre. Where is the justification for spending this kind of money on something that will reach saturation in a short period? You mentioned that the metro is still running below capacity. To play devil’s advocate here, can the pod taxi be a parallel system since at-grade solutions are not ‘saleable enough’? But why? That is my question! Now let’s look at BMRCL. It is such a wonderful system but being provided in a way to discourage people not to use it! Instead, market bad solutions like elevated corridors and pod taxis as wonderful systems. The ride quality and coach designs in the metro are world class. But the information system is terrible. The metro network map in stations so important, but how and where are they displayed? The access egress (exits) from the metro stations are terrible. Their mindset seems to be “we will provide you a world class facility. But once you step out of our station, how you manage to get to your destination is your headache”. The BMRCL officials go to other countries to study these systems and yet seem to have learnt little. So are the MLAs who go on these junkets. They should use public transport systems in these cities and understand the idea of last mile connectivity. Once you get of the metro in any other country, you are not left without any information, till you get to your destination. The information system is so well thought out. Where is that in Bangalore? There is no integration. In fact, private players can pitch in to close this gap of information. Look at European cities like London, Berlin, Zurich or Paris. But you can compare it to Tokyo, which is a favourite with our friends from the government? Let’s look at Tokyo. The reason I would look at London or Paris is because they have populations similar in size to that of Bangalore. Tokyo, on the other hand, is the most densely populated city in the world with about 3 crore people living in it. Yet it has a metro system that is spread over 300 kms that has worked for more than a hundred years and walking share is about 30%. We can’t look at only those figures that are convenient to us. Where are the Pod Taxis Planned? When is Namma Metro Phase-I expected to complete realistically? Started almost nine years ago, the Phase-I of Metro is reaching the completion stage. However, it will be the end of this year before the first phase is through. 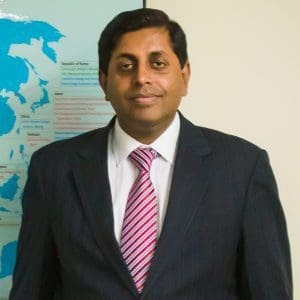 I would be more persuaded by Professor Verma, were he to cite computer simulations that clearly demonstrate the level of incapacity he charges against PRT systems, or the unacceptably long door-to-door times that he seems to imply will disappoint PRT users. When I looked at such simulations for my own community, I was instead very much impressed with the high capacity of PRT overall, as well as by the substantial reduction in total (door-to-door) average trip time, which people here would enjoy in comparison with buses bicycles, or (proposed) rail service. Indeed, PRT often proved equal to or slightly better than the personal automobile, even in the best case of unclogged, free-flowing traffic at-grade, because a PRT vehicle never needs to stop for stop signs or traffic signals, and there is no need to find a parking space (which might end up being a block or so away from one’s intended destination, anyway). The professor rightly points out that, with the exception of airport circulators and academic campus connectors, PRT has not been adopted as a general/main transit system anywhere in the world. But when I look at the history of efforts to build PRT systems, I see the seemingly tireless efforts of people such as Professor Verma, who draw ill-fitting comparisons between PRT and other modes or transit, or other, failed projects (e.g., the Goa Sky Bus), which, in turn, have the effect of scaring the public and government officials into “erring on the side of caution,” and going with “tried and true” modes of transit that end up costing a lot of money and not helping the local transit situation very much. 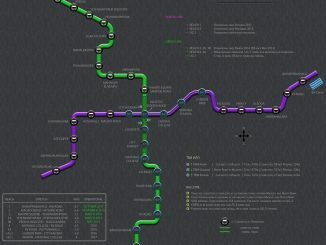 Lacking real-world examples for an “apples to apples” comparison, our only recourse is to turn to computer simulations, in order to get an appreciation for how much or little any particular PRT proposal can be expected to help improve local transit. Systems for such simulation do exist, and any real transit expert worth the title would know of them, and probably have access to them. So my question is, has Professor Verma seen relevant simulations and, if so, do the results favor the Bengaluru PRT proposals or not? Finally, in terms of cost to construct or operate PRT, the public should note that the infrastructure for real PRT is light-weight and of small (ground) footprint. Proposals that involve huge, bulky, expensive concrete or steel structures deviate significantly from the PRT ideal, and should be viewed with some skepticism, including examining them for other deviations from the ideal model — deviations which could drive up cost, or compromise system capacity and performance. Professor Vermer compared the Bengaluru PRT plans with the failed Goa Sky Bus project. It is important to note that the latter effort was NOT anything close to PRT, nor even to true Group Rapid Transit (GRT), such as has existed and operated safely in Morgantown, West Virgina USA, for several decades. The steel infrastructure for Sky Bus was huge and bulky — a necessity because the vehicles were almost literally long “buses in the sky,” something between high-capacity buses and light-rail cars. Because PRT pod-taxis are so small and light, the infrastructure supporting them can be correspondingly unimposing and lightweight, and the public should demand that it IS, for no other reason than the smaller infrastructure and vehicle stock will guarantee lowest cost of construction and operation.